Gantsilyo Guru: Tunisian Crochet For Beginners! Don't be intimidated by the term. This crochet technique is probably one of the easiest to learn. Known with using an Afghan Hook (resembling a knitting needle in length but with a hook), this style of crocheting produces a durable and slightly elastic fabric and is worked without turning. 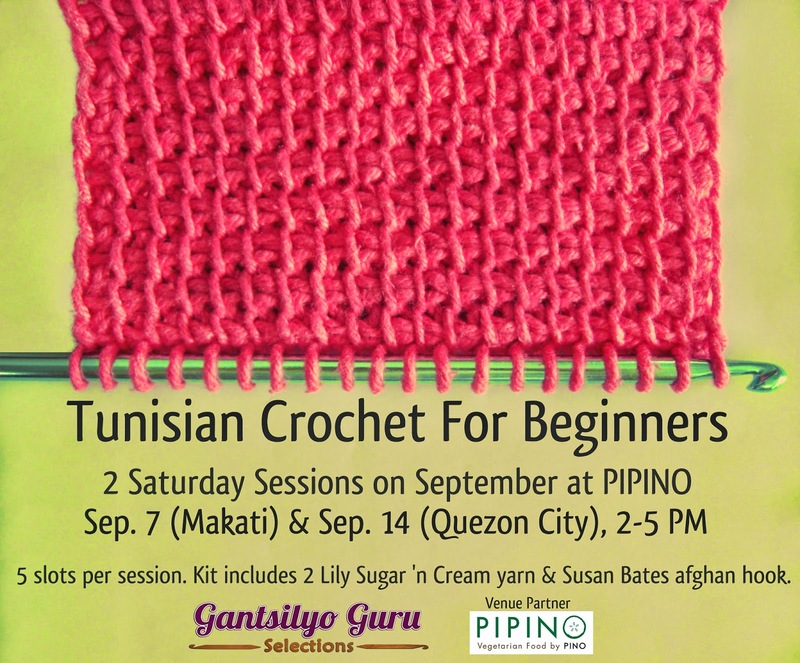 In this workshop, you will learn the basic stitches of Tunisian Crochet using Lily Sugar N' Cream yarn and Susan Bates Afghan Hook. In the poster though, I used Creme de la Creme yarn for the sample swatch. This yarn is very similar to Lily Sugar 'n Cream. Both are worsted weight cotton. Lily Sugar 'n Cream will be available soon, in very limited quantities and colors, in my online store Gantsilyo Guru Selections. Susan Bates Afghan Hook may already be purchased there as well. Creme de la Creme yarn will be available in the country by end October! Workshop fee is P1,250. With this, a participant gets to take home 2 skeins of Lily Sugar 'n Cream yarn (colors to be chosen by the participant from the stash available), a Susan Bates Afghan Hook, and illustrated instructions. Delicious vegetarian food from Pipino will also be served! Check out Life After Breakfast's feature (which also has a map to these venues) on PIPINO's branches in Makati and Quezon City. There will be :) Will be holding more in the future. Kindly keep checking the "Workshops" tab on this blog for the updated calendar. Thanks and all the best for your special day! 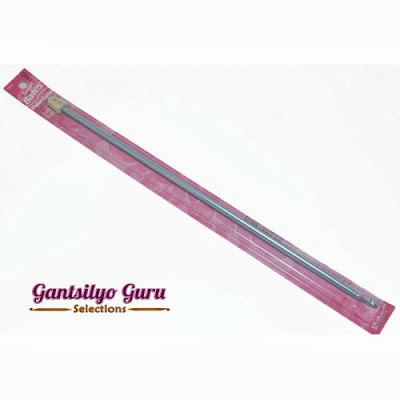 Sale Alert at Gantsilyo Guru Selections! Gantsilyo.com Now Open To Serve You! Gantsilyo.Com Opening on August 11!